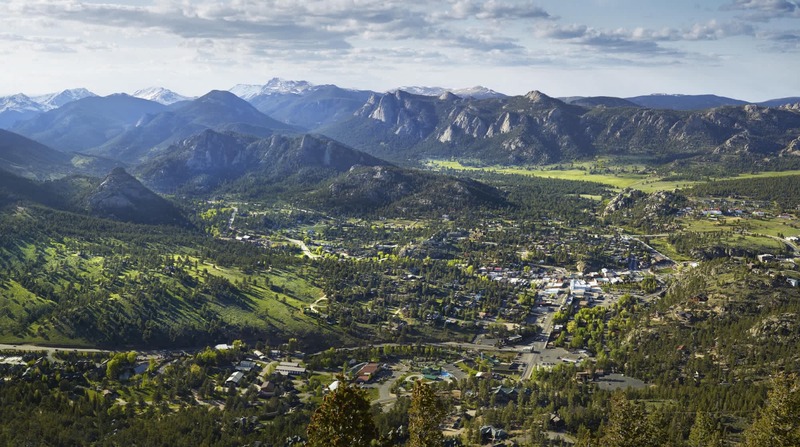 Hit the open road to Estes Park this summer. Literally. Highway 34 is now open, after 23 months of closures—and nearly five years of ongoing repairs. 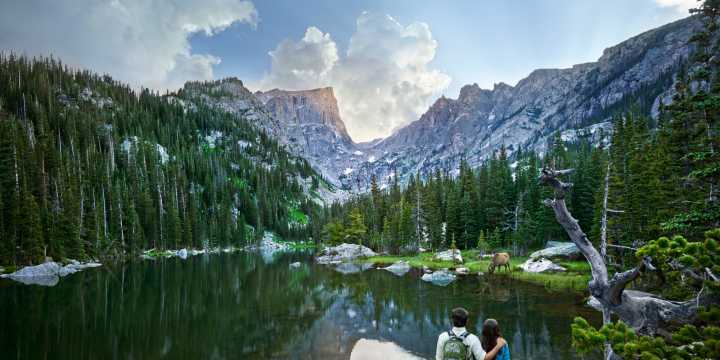 This stretch of highway—arguably one of the prettiest drives in Colorado—weaves through the steep and rocky Big Thompson Canyon and provides residents of Northeastern Colorado and surrounding areas a direct shot to the mountain-town spoils of Estes Park. 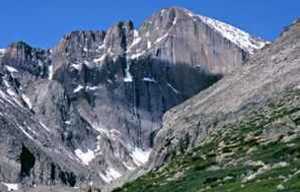 The long-awaited opening will save at least 40 minutes over the detour and thankfully comes just in time for Memorial Day, when the springtime weather starts hinting at summer and being outside in the mountains is irresistible. Seasonal wildlife sightings are fascinating, with elk calving and grazing on the spring greens. Wildflowers boom as snow continues to melt, offering colorful pops across the tundra. 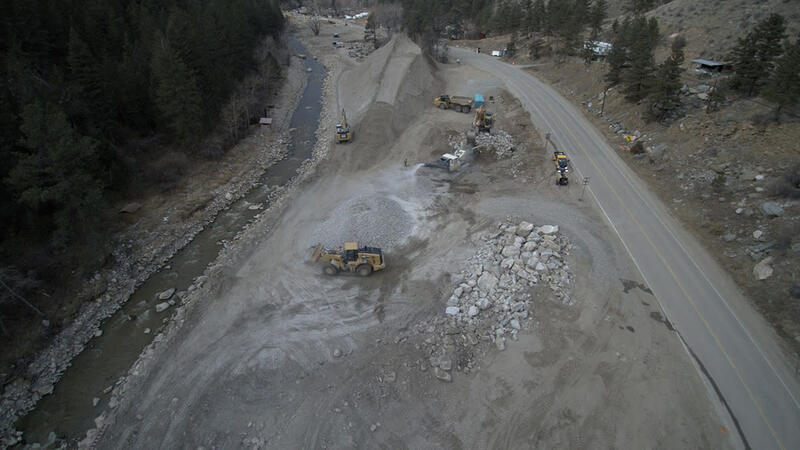 Aerial shot of Highway 34 construction courtesy CDOT. "A tremendous amount of work has been put in to make this opening before Memorial Day happen. This project has affected so many people in different ways, especially the residents of the Big Thompson Canyon. To all who have been impacted by this project, no matter how big or small, thank you for your patience and for working with the Project Team!" said James Usher, CDOT project director. "As the highway opens, my hope is that everyone can let out a big sigh of relief knowing that not only the highway and river system is now much stronger but that the canyon community and the communities the canyon connects are stronger as well," Usher added. Some work remains to be completed on the road throughout this summer and fall, so leave early and stay late (or overnight) to avoid pilot cars and potential temporary delays. Begin planning your activities and lodging today. 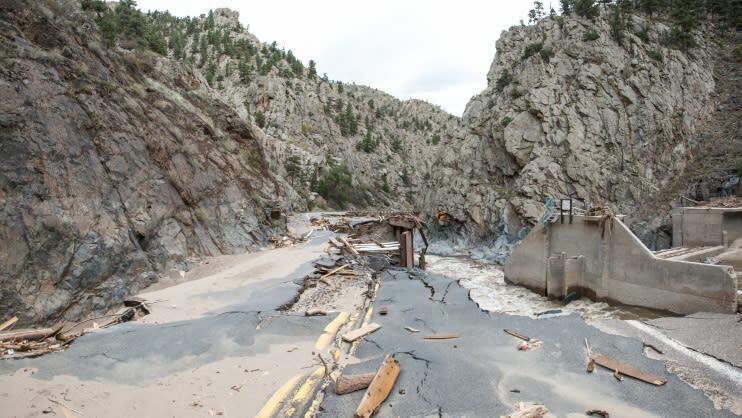 Damage to Highway 34 in 2013, courtesy CDOT. The 2013 flood caused $3.9 billion dollars in damages and led to the evacuation of 18,000 people across Colorado’s Front Range. 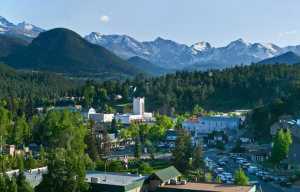 In 2013 an emergency repair project was enacted on route 34 to allow travel between Estes Park and Loveland as quickly as possible. This project did not provide long-term solutions to erosion and future flood mitigation, however. Design for the permanent repairs began in the summer of 2014, with construction beginning 2016. CDOT and Kiewit undertook the Herculean task, building a new bridge at Horseshoe Curve, and generally reinforcing the road to better withstand floods and erosion in the future. Crews have blasted and removed nearly 400,000 cubic yards of rock to move the roadway onto bedrock. Flood mitigation work included building an entirely new roadway where 8,800 tons of rock was placed deep below the pavement and gaps were filled with concrete grout to create a more solid foundation, reducing potential erosion and making the roadway more resilient. And it’s safe to say northern Colorado is psyched about all of it. 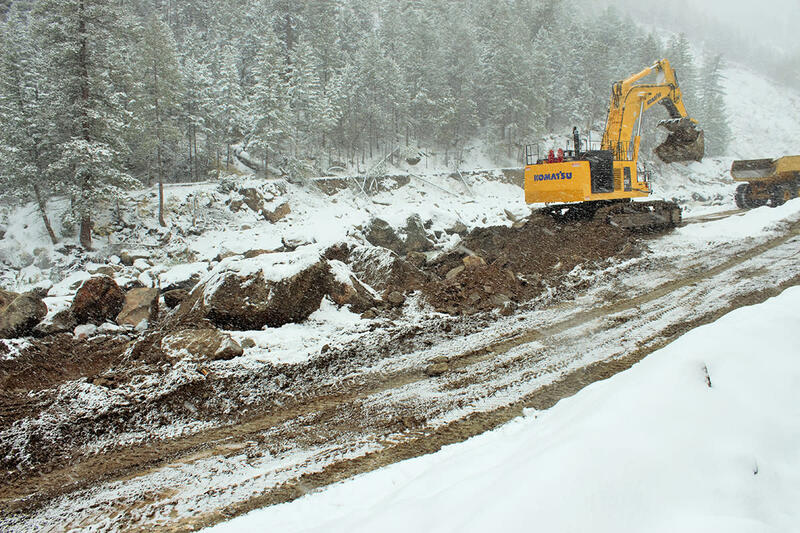 Crews work through the snowy winter to repair Highway 34, courtesy CDOT.